Here at Lovely Girlie Bits, we've been trying out different hair products, some new and some old favourites. As always, I try when I can to come up with funny names for posts when I can. Of course the first one that came to mind when writing this post didn't quite sound right when I thought about it. "Lovely Hairy Girlie Bits", no, maybe not. Lush-ious Locks it is. Today I'll be talking about a shampoo and conditioner from Lush that I love so much, I've repurchased them twice. I discovered them in the Lush after Christmas sale last year and haven't looked back! First up is the shampoo. It's called I Love Juicy (£9.50 for 250g) and to be honest, I only "got" the name about two weeks ago but I'm sure all you smarty pants will have gotten it right away. This is a shampoo designed to help greasy hair feel really clean and is crammed full of the fruit juice of mango, pineapple, kiwi and papaya. I have oily hair (to go with my oily T-zone) and I need to wash it every day, especially now that I'm blonde. Dirty roots are not a good look for anyone. 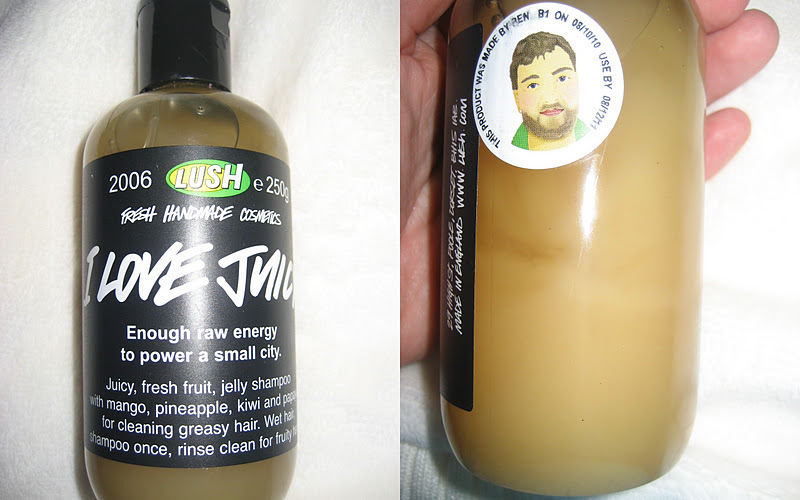 I Love Juicy smells a bit like like Fruit Pastilles but the scent doesn't linger in the hair. You can see in the above photo on the right that it separates a bit so you need to give it a good shake before starting. It lathers up really easily so I don't need a huge amount at all each time I use it which is grand because it lasts ages that way. My hair is left squeaky clean when rinsed out and that makes me happy. I use this about once a week as a clarifying treatment for my hair. I usually combine I Love Juicy with American Cream conditioner. It's described as a double strength conditioner full of fruit and vanilla. I don't get the scent of fruit in it, just the vanilla but it's not sickly sweet. It leaves a really light fragrance on the hair that's comforting. I know that sounds weird but vanilla makes me feel warm and cozy! I'll find the price in euro for both of these products but for this 250g bottle it's £8.50. The Lush website describes it as a "thick heavy conditioner" but it's actually quite thin compared to my usual conditioners. When I apply it to my hair, it's almost like my hair soaks it up completely, leaving none of that slippy conditioner feeling that I'm used to. The first time I applied it and went about my other showerly business I thought "what a waste of spondoolies, I can't feel anything on my hair". Even when I rinsed it out, my hair didn't feel any different. It was only when I dried my hair that I was left with gorgeously smooth, shiny, sleek locks. It doesn't weigh my hair down, something I'm conscious of with the big greasy head on me. Let's hope for me that they don't discontinue these! Have you tried either of these products? How did you get on or what would you recommend I try next ladies? I might have to go shopping on Saturday so enable me like the good girls you are! I love lush's BIG shampoo, gives a great clean as well as volumising. Their Big Tease styling cream is great too. American Cream is brilliant, I use it when my hair is in exceptionally bad nick. Lovely Girlie Favourite Bits of 2011! Winner of Skin Essentials by Mariga! Won't you take me to Tinsel Town? Chanel giveaway! Two Rouge Carats up for grabs! Winner of The Body Shop's Shimmer Cube! Professional Beauty Dublin 2011 haul!